We are just back from a 7 day cruise on the Disney Fantasy where we participated in a Disney Cruise Fish Extender Exchange for the very first time. A Fish Extender Exchange gets its name from the fish themed hooks that are installed outside of each cabin on a Disney ship. People hang pockets from these hooks to exchange gifts very much like Secret Santa with one another. I am assuming if you are reading this post you have booked a cruise and just heard the term Fish Extender and want to know what it is, how to play along and if it is worth it. 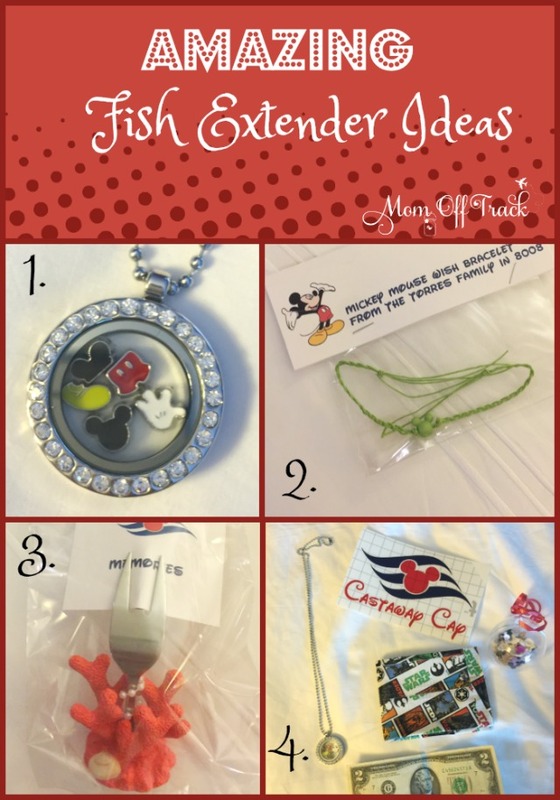 So, let’s get to breaking down all this Disney Cruise Fish Extender information for you. How Do You Join a Fish Extender Exchange? The easiest way is to go to Facebook and join the group Disney Cruise Line Junkies. From there you should be able to find your cruise specific group. Mine was called Disney Fantasy August 13-20 2016 so you can search for yours which is likely in a similar format. Some people also search Disboards for this information. I liked Facebook. There can and will be many Fish Extender groups for every cruise. You ask to join a Fish Extender group and when accepted you fill out some information about your family that will be shared. About 90 days before sailing you will get a spreadsheet with your teams cabins, names, ages and some other personal notes about each family (like if they are celebrating a birthday or anniversary). Our fish extender group had 10 families in it and that was about right. I could not have handled more than 15 families. How Do I Get a Fish Extender? Above is our Fish Extender pockets. I bought mine on Etsy from The Rabbit’s Hole Shop. Can’t recommend her highly enough. Her listing said it could take weeks and I had it within days and it was very well made. I loved that it doubled as a blackboard as well on the top. There are tons of other creators on Etsy as well. Just do a search. They have all kinds of specific themed ones. The Star Wars ones are pretty cool. You can also make your own pretty easily. 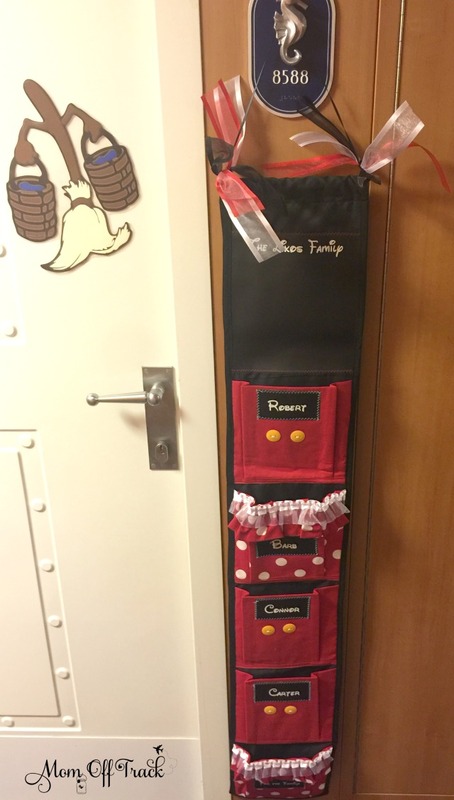 There are all sorts of tutorials out there and from what I hear a lot of people use a baby organizer from Walmart and just cover it in the fabric of their choice. You do want a pocket for each person in your family coming. I liked on mine how I can change the vinyl names depending on who is cruising with our family next. What do you give as a Fish Extender present? I took a look at our spreadsheet and broke down the categories into 3 main categories: kids, moms and dads. I then decided to give the older teens the same gifts as moms and dads. 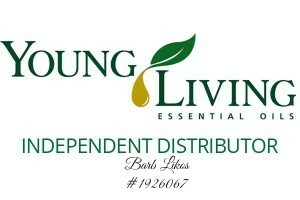 Here is what we gave. 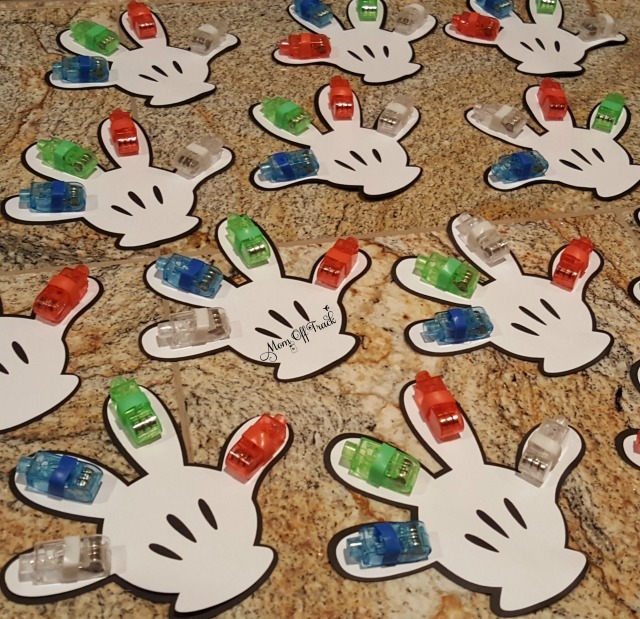 You may remember me blogging about how to make Mickey Finger Lights a few weeks ago. Just click the link to figure out how I did it. These were fun and easy to make. They took about 5 mins a pair for your planning purposes. The video below the picture explains how to do it. Bead set-I bought one with different colors at a local craft store with a 40% off coupon. I used 10 mm and 6 mm for the sizes. The video recommends 12 mm and 8 mm. You can buy the Swarovski ones as well. 2 inch head pins-be very careful not to get ones that are too small on the end. These decorative ones worked perfectly. Plier set-you need Round nose and Flush Cutters for sure. 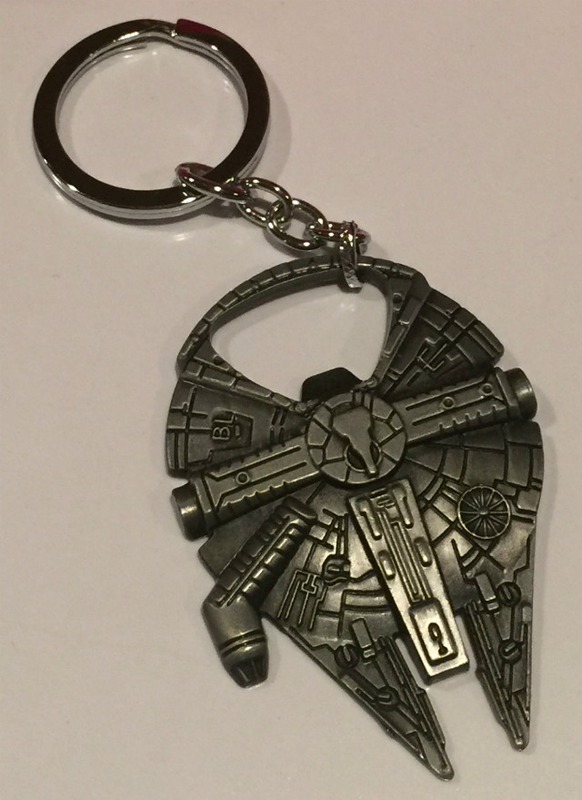 These millennium falcon key chain and bottle openers are perfect for fish extenders for guys. Where I got them is the best kept Fish Extender secret of all: AliExpress. This place has it ALL when it comes to Disney stuff. Just do a search and tons and tons of options will pop up. The one drawback is it all mostly comes from China and shipping can take months. Order your items as soon as you possibly can and pay close attention to the shipping times. 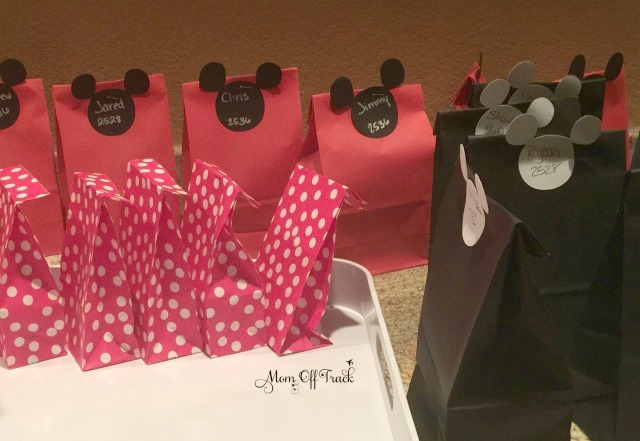 I packed all the items in gift bags with Mickey Mouse heads as tags that I made with my Cricut. What Did You Receive as Fish Extender Gifts? So now that you know what we gave, I am sure you are wondering what we were gifted in return. 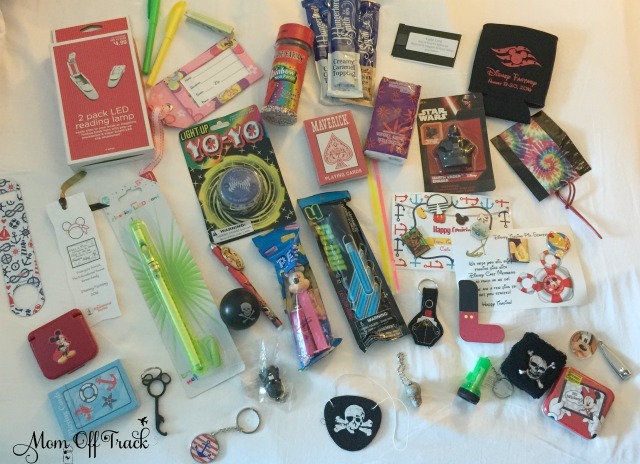 Lots of keychains, decks of cards, stickers, pens, highlighters, bookmarks and glow sticks. It made me sorry that we also gave bottle openers because they are a very common item to receive. 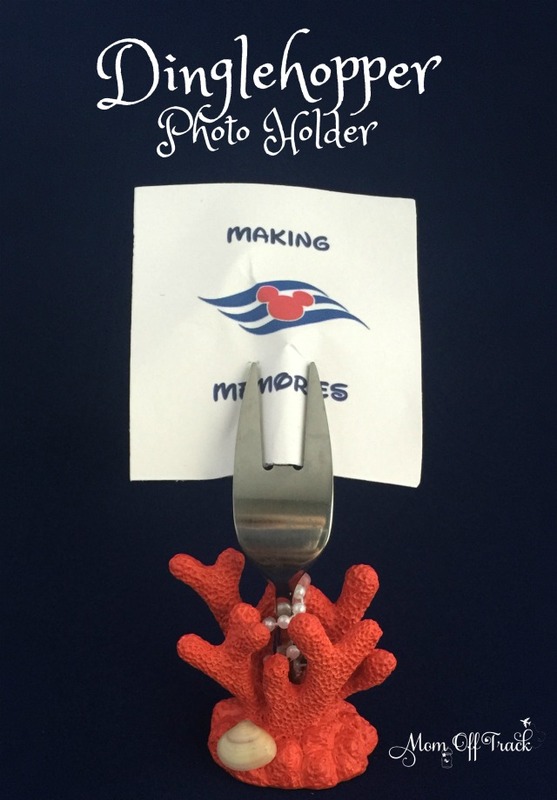 We loved the handmade keychain with the ship, the adorable L magnet made just for us, the pins for trading were great because we didn’t bring any to get us started. The book lamps were very thoughtful, the nail clippers much needed (again, forgot! ), the drink cozys with the name and date of the cruise are great! I loved the screen wipers and the sundae making kit was a great touch. Also, the handmade luggage tag will come in handy for years to come. The eye patches and pirate wrist bands were great for pirate night and not shown were the cute rubber bracelets with name and date of ship made for little kids that we pixie dusted to the kids next door because they were too small for any of us. I most definitely had some favorites though. I love, love. love this necklace. I wore it from the time it arrived until we flew home and will treasure it. I am pretty sure that it is made using these items from AliExpress- floating necklace and a combination of these mickey charms. Wish Bracelet-this is made with simple thread and is designed to break over time releasing the bead and your wish. Lots of people sell these on Etsy or they are very simple to make on your own. Castaway Cay vinyl sticker-we are going to put this on our new Mickey Mouse luggage–which by the way was amazing and I highly recommend. I have seen the Vinyl stickers for sale on Etsy but they are also super easy to make with your Cricut machine. You can even buy the SVG file on Etsy for a few bucks to make your life easier. Also adorable in that photo was the handmade duct tape wallet with the $2 bill in it. Is It Worth Participating in a Fish Extender Exchange? We thought so and will do it again on our upcoming Disney Wonder Cruise. There was a lot of knick knack items and I really appreciate homemade creative items but that’s just me (obviously if you follow this blog you know that, lol). But everything was a thrill to come back to the room and find and was thoughtfully put together. There were many more great items I just simply can’t highlight. This post is getting crazy long. Any Other Fish Extender Hints? Try not to deliver everything on the first day. Somehow our group had amazing timing and there was something every day in our pockets. Do research on Pinterest. I have started a board full of Fish Extender Ideas. 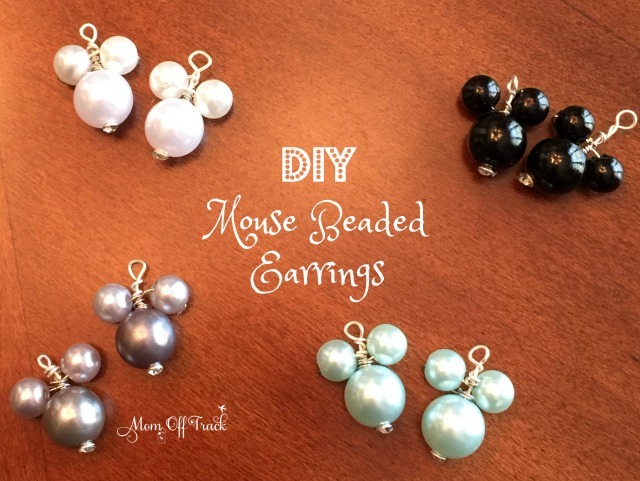 You can find lots of really cute ideas to make or buy. Join the Disney FE Group on Facebook for even more ideas and answers to your questions. There is also a Facebook group for buying FE items. Make your tags before you leave but do not pack the items in the bags. Many of mine were smashed and went through a TSA rifling. Next time I will bring the gifts in big ziplocs grouped by kind, the bags, a stapler and premade tags. Arrange the gifts for delivery by floor and team it up with the Mid Ship Detective Agency game for easier drop offs and fun for the kids. Our coordinator made deck plans for us with everyone’s cabins marked off. If yours doesn’t, print them out at home and put a star next to all your cabins. A lot of people delivered their stuff in ziplocs. Those were great for packing stuff on the way home. Remember to have extra room in your luggage for all the stuff you will be bringing home. Thank you so much for this article- it was my go-to for ideas for our first FE experience this Fall. Ended up purchasing most of our items through the AliExpress site, so thank you for the recommendation! Oh that’s awesome. Thank you for letting me know it was helpful.